This lemon pepper chicken is a crowd worthy dish to serve up any day of the week. 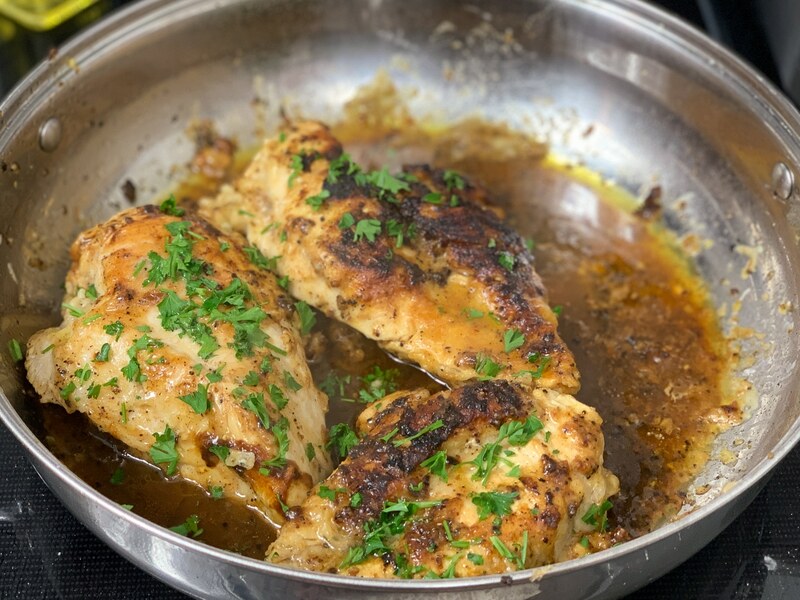 Grab your skillet and let’s cook up a juicy, tangy, peppery and savory chicken dinner. My lemon pepper chicken breast recipe is a tried and true, that I have been making for years. There is something about the pairing of lemon, pepper, and chicken. Serve with your favorite side dishes and you have a dinner that is simple to make but highly satisfying. You all know me and my chicken I can’t’ get enough. And to be honest, is do you ever have too many chicken recipes to test and try out? I think not! The chicken cooks up into a golden brown color that is stunning to serve up. The mix of citrus from the lemon paired with the pepper is just a sensational dish. I promise you will love this recipe, you will have dinner on the table in 30 minutes or less. You will want to print this recipe. Whether you use a homemade lemon pepper or a store bought it will bring you bright and bold flavors. 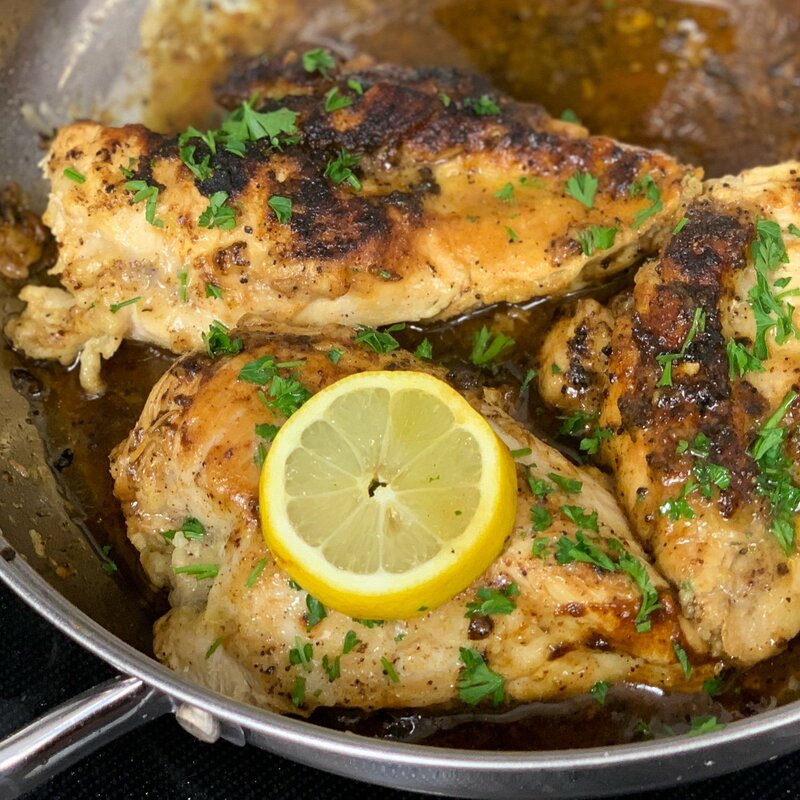 I find that using real lemon zest brings so much more flavor to the chicken, but in a pinch, you can buy a quality lemon pepper seasoning to sprinkle over the top. 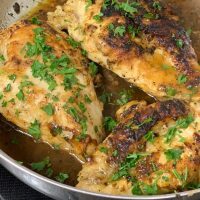 And if you don’t feel like standing over the skillet you can always use this same recipe and make baked lemon pepper chicken. Or mix it up a bit and add a garlic lemon sauce. Pretty much any side dish will do, but if you need some guidance here are some great side dishes to consider. We had these Creamy Loaded Mashed Potatoes but you could eat it with anything. Lemon pepper seasoning is a mix of black peppercorns paired with lemon zest. Now if you buy bottled it is dried lemon zest or you are welcome to use fresh lemon zest as well. The beauty of this is you can go from chicken thighs to boneless chicken breasts. You just adjust the cook time depending on which cut of chicken you use. I generally reach for chicken thighs or boneless chicken breasts. But, feel free to use any of your favorite cuts. A very light and bright seasoning that taste amazing any time of year. I generally love to serve this up in the spring and summer months, but sometimes I get to craving it in the winter. 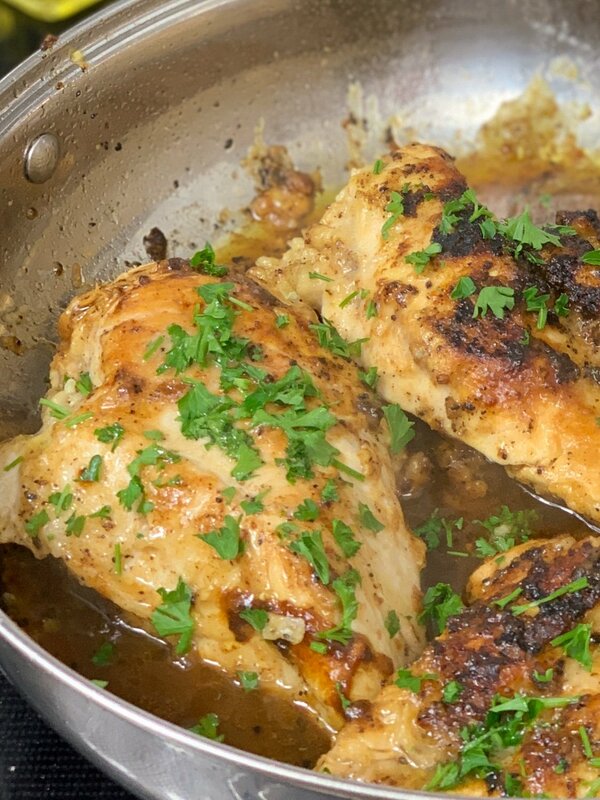 What is so nice about this recipe is you make it right on the stove top in a sturdy skillet. It crisps up the chicken so when you slice it, you have the crispy outside with a tender and juicy chicken on the inside. No need for any fancy kitchen device, just use a skillet and you are good to go. Give my lemon pepper chicken recipe a try and let me know what you think. It is so easy to whip up, that you might keep it in regular rotation. Enjoy your new family favorite chicken dish. My lemon pepper chicken breast recipe is a tried and true, that I have been making for years. There is something about the pairing of lemon, pepper, and chicken. Add flour and chicken breasts to a large bag. Toss to coat well. Set aside. Combine lemon zest and seasonings in a small bowl. Season both sides of each chicken breast well. Melt butter in a cast iron skillet over medium-high heat. Add seasoned chicken breasts, cooking 5-7 minutes per side, or until no longer pink. 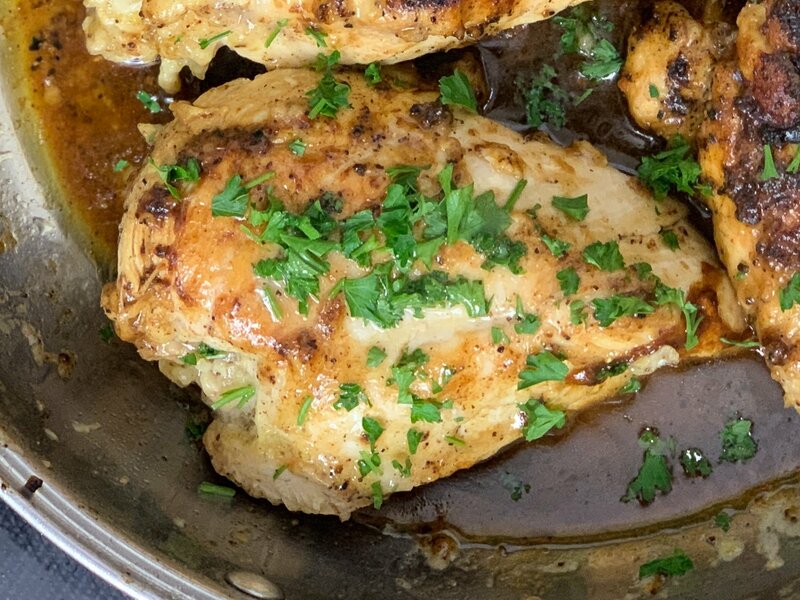 Remove chicken breasts from skillet. Serve with a green salad, rice or vegetables and lemon slices or wedges.